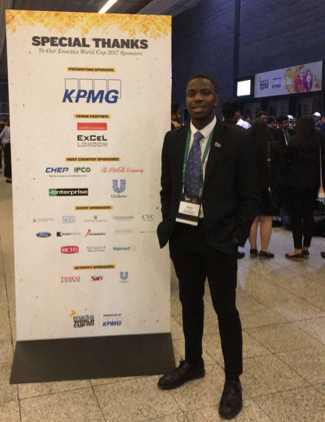 AdEwale okusipe, an enactus essex student has been named as one of the UK top 100 afro-caribbean undergraduates and graduates for 2017/2018. "I am humbled to be one of the UK Top 100 Afro-Caribbean undergraduates and Graduates 2017/2018 in the Future Leaders magazine. This is a magazine put together by Powerful-Media Limited who partner with HSBC to create this amazing project. The magazine features around 100 students who have a good academic record with outstanding leadership skills. The magazine has been published for the last 7 years with a fantastic set of students featuring every year. Having heard about Future Leaders for the first time, it really was an eye opener for me. Joining Enactus Essex has given me the opportunity to develop my leadership skills, and I have been encouraged to put my skills to the test. Being a project leader at Enactus Essex really gave me a full experience of being a leader. I was a project Leader of Big Difference which is based in Clacton-on-Sea and Braintree. Our goal is to help our beneficiaries gain the skills they needed to reach their personal goals. I led a team of 16 students who all played a major role in ensuring that the project was successful and the project allowed Enactus Essex to be in the Enactus UK National Competition 2017. In addition, I was also part of the Elevation Network Leadership programme for 2016/2017. This programme was initiated by Elevation Networks and only 10 students were participants in that year. Being part of this programme, helped me to gain a leadership qualification and also allowed me to create a social enterprise project for young children. Being in Enactus has helped me to develop major skills that will make me a potential future Leader tomorrow. joining Enactus has launch me into a future of great opportunities".